More than 6-in-10 (63%) Americans agree that over the last few years, the weather has gotten more extreme. Roughly 3-in-10 (29%) say the weather has not changed, and less than 1-in-10 (6%) report that the weather has become less extreme.There is a strong consensus among Democrats (76%) and independents (59%) that the weather is getting more extreme. Republicans are divided, with 46% reporting that weather is getting more extreme, and 45% reporting that the weather has not changed. More than one-third (36%) of Americans believe that the severity of recent natural disasters is evidence that we are in what the Bible calls the end times. Roughly 6-in-10 (59%) Americans disagree. Nearly two-thirds (65%) of white evangelical Protestants believe that the severity of recent natural disasters is evidence of what the Bible calls the end times, compared to roughly 1-in-5 Catholics (21%) and religiously unaffiliated Americans (15%). Four-in-ten (40%) independents, 35% of Democrats, and one-third (33%) of Republicans agree that the severity of recent natural disasters is evidence that we are in what the Bible calls the end times. By contrast, more than 6-in-10 (63%) Americans say the severity of recent natural disasters is evidence of global climate change, while one-third (33%) disagree. Nearly 7-in-10 (69%) religiously unaffiliated Americans, 6-in-10 (60%) Catholics, and half (50%) of white evangelical Protestants agree that the severity of recent natural disasters is evidence of global climate change. Seven-in-ten (70%) Democrats and 65% of independents agree that the severity of recent natural disasters is evidence of global climate change, compared to only 43% of Republicans. A majority (55%) of Republicans disagree. A majority (55%) of Americans agree that God gave human beings the task of living responsibly with the animals, plants, and resources of the planet, which are not just for human benefit. Nearly 4-in-10 (38%) Americans disagree, saying that God gave human beings the right to use animals, plans, and all the resources of the planet for human benefit. Three-quarters of Americans agree that there is solid evidence that the average temperature on earth has been getting warmer over the past few decades. Roughly 1-in-5 (21%) Americans say there is not enough solid evidence to support this assertion. More than 8-in-10 (86%) Democrats and three-quarters (75%) of independents believe the temperature on earth has been rising over the past few decades, compared to 54% of Republicans. Views about the evidence for global warming have shifted dramatically over the past few years. According to the Pew Research Center, in 2006, close to 8-in-10 (77%) Americans said they believed there was solid evidence of increasing temperatures on Earth. But in 2009, agreement dropped to roughly 6-in-10 (57%). This remained steady until 2011, when PRRI’s September PRRI/RNS Religion News Survey showed that belief in evidence in support of warming had edged back up to roughly 7-in-10 (69%). Among Americans who believe the earth is getting warmer, a majority (60%) say these temperature changes are the result of human activity such as burning fossil fuels. More than one-third (34%) of those who believe temperatures are increasing say that these changes are due to natural patterns. Two-thirds (67%) of Americans say that the U.S. government should do more to address climate change. There are significant generational and political differences on this question. Nearly 7-in-10 (69%) Millennials (age 18 and older) agree that government should do more to address climate change, compared to 54% of seniors (age 65 and older). More than 8-in-10 (83%) Democrats and nearly two-thirds (66%) of independents also agree that the government should do more to address the issue of climate change, compared to 43% of Republicans. 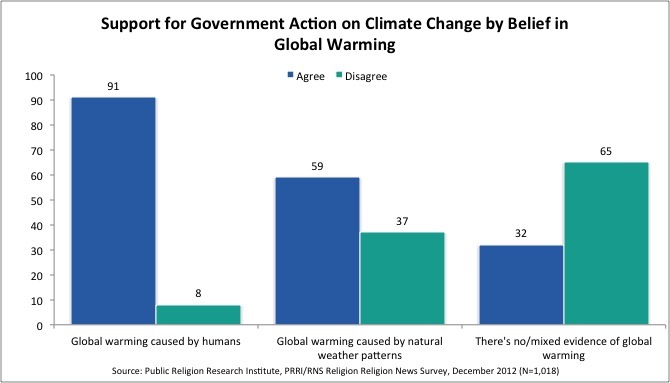 A majority (55%) of Republicans say the government should not do more to address climate change. Nine-in-ten (91%) Americans who believe global warming is caused by human action and nearly six-in-ten (59%) Americans who believe global warming is due to natural weather patterns agree that the U.S. government should do more to address the issue of climate change. Nearly 6-in-10 (58%) Americans agree that God is in control of everything that happens in the world, while nearly 4-in-10 (38%) disagree. Nearly 9-in-10 (89%) minority Christians, roughly three-quarters (76%) of white evangelical Protestants, 6-in-10 (60%) Catholics, and a slim majority (51%) of white mainline Protestants agree that God is in control of everything that happens in the world. However, only 3-in-10 (30%) religiously unaffiliated Americans agree with this statement, while 6-in-10 (60%) disagree. Roughly 3-in-10 (29%) Americans agree that God sometimes punishes nations for the political decisions their citizens make. Nearly two-thirds (65%) of Americans reject this idea. White evangelical Protestants (57%) are more likely than to believe in divine retribution for political decisions than are minority Christians (39%), white mainline Protestants (22%), Catholics (25%), or religiously unaffiliated Americans (17%). Nearly 6-in-10 (57%) Americans agree that the political choices being made by Americans these days are moving the U.S. away from God, while more than one-third (36%) disagree. Nearly 9-in-10 (89%) white evangelical Protestants and 53% of Catholics agree that Americans’ political decisions are moving the country away from God. Only roughly one-third (34%) of religiously unaffiliated Americans agree. Only 2% of Americans believe that the end of the world, as predicted by the ancient Mayans, will happen by the end of this year. However, 15% of Americans believe that the end of the world, as predicted by the Book of Revelation, will occur in their lifetime. College graduates are four times less likely to believe that the world will end in their lifetime than are Americans with a high school education or less (5% vs. 22%). Roughly 3-in-10 white evangelical Protestants (29%) and minority Christians (27%) believe that the end of the world, as predicted in the book of Revelation, will occur in their lifetime. By contrast, no more than 1-in-10 Catholics (10%), white mainline Protestants (8%) and religiously unaffiliated Americans (7%) hold this belief. Jones, Robert P., Daniel Cox, and Juhem Navarro-Rivera. “Americans More Likely to Attribute Increasingly Severe Weather to Climate Change, Not End Times.” PRRI. 2012. http://www.prri.org/research/prri-rns-december-2012-survey/. This is a legal agreement between you, the end-user (“User”), and PRRI. By downloading the survey data from the PRRI web site (“Data”) you are agreeing to be bound by the terms and conditions of this agreement. If you do not agree to be bound by these terms, do not download or use the Data. PRRI bears no responsibility for the analyses or interpretations of the data presented here. The Data is provided “as is” without any warranty of any kind, either express or implied, arising by law or otherwise, including but not limited to warranties of completeness, non-infringement, accuracy, merchantability, or fitness for a particular purpose. The User assumes all risk associated with use of the data and agrees that in no event shall the center be liable to you or any third party for any indirect, special, incidental, punitive, or consequential damages including, but not limited to, damages for the inability to use equipment or access data, loss of business, loss of revenue or profits, business interruptions, loss of information or data, or other financial loss, arising out of the use of, or inability to use, the data based on any theory of liability including, but not limited to, breach of contract, breach of warranty, tort (including negligence), or otherwise, even if User has been advised of the possibility of such damages. 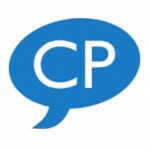 PRRI has taken measures to ensure that the Data is devoid of information that could be used to identify individuals (e.g., names, telephone numbers, email addresses, social security numbers) who participated in or who were the subject of any research surveys or studies used to collect the Data ("Personally Identifying Information.") However, in the event that you discover any such Personally Identifying Information in the Data, you shall immediately notify PRRI and refrain from using any such Personally Identifying Information. This license will terminate (1) automatically without notice from PRRI if you fail to comply with the provisions of this agreement, or (2) upon written notice (by e-mail, U.S. or otherwise) from PRRI. Upon termination of this agreement, you agree to destroy all copies of any Data, in whole or in part and in any and all media, in your custody and control. This agreement shall be governed by, construed and interpreted in accordance with the laws of the District of Columbia. You further agree to submit to the jurisdiction and venue of the courts of the District of Columbia for any dispute relating to this Agreement. I agree to terms and conditions* You must agree to the terms and conditions above to download the data set.